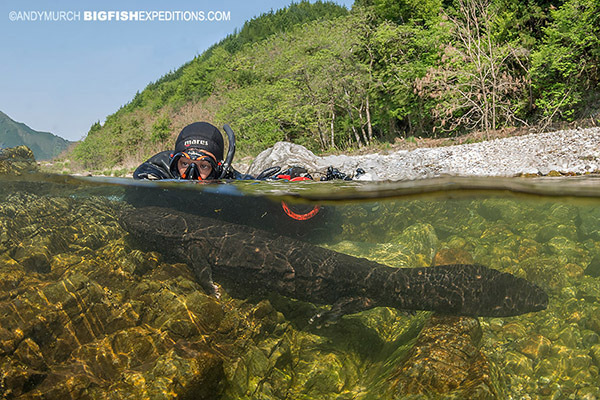 Snorkel with the giant salamanders of Japan! Imagine this unique encounter. You don your wetsuit and step into the river. It is not deep – maybe 1.5m at its deepest. Wading over to a craggy rock outcrop you quickly slip into the lea to avoid the current that is trying to drag you down river. Ducking your head underwater you scan the area for overhangs that may harbor your quarry. Peering into the shadows, you see nothing but small fishes and flattened river rocks piled together. Disappointment starts to rise but then one of the rocks moves slightly and it dawns on you that the flattened rock you have been ignoring is the dinner plate sized head of a giant salamander! The rock monster stirs. It clambers over the other rocks that you now realize are all actually heads with tiny eyes. Then it beats its tail sideways and snakes casually past you towards the river bank. You give chase. Once in shallow enough water, it lets out a stream of bubbles from its nostrils then raises its head to take a much needed breath. You swim with it up into the shallows with your camera and frame an epic shot of it moving between the aquatic and terrestrial worlds. Now that’s a shot your dive buddies don’t have! 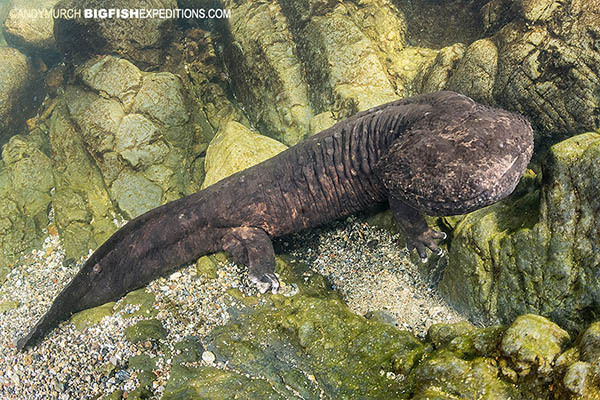 Japan’s giant salamander is the world’s second largest amphibian, topped only by the slightly longer Chinese giant salamander. Reaching a whopping 1.5m in length, these gentle giants have no natural enemies other than man. It is estimated that they live upwards of 80 years in the wild. Giant salamanders have no gills. They rise periodically to the surface to breath but like other amphibians, they can absorb some oxygen through their skin. Consequently, they are confined to shallow, cool, well oxygenated streams in the mountains. They hunt for small fishes; mostly at night. Their eyesight is very poor, but – just like sharks – they have a lateral line system of sensory pores in front of their mouths and running down their flanks. When a fish strays too close to the business end of these generally lethargic animals, they are capable of lightening fast lunges. Be warned, every year, one or two unfortunate swimmers end up seeking medical attention after accidentally putting their fingers or toes in the ‘strike zone’. And although they look relatively harmless, giant salamanders have sharp teeth and are capable of clamping down on a finger and then spinning like a crocodile! 2 days of snorkeling with Giant Salamanders in the mountain streams of Gifu. 1 night’s shared accommodation in a traditional Japanese hotel in Gifu Mountain Region. Japan’s most experienced giant salamander guide. Return transfers from Tokyo to Nagoya on Japan’s famous high speed ‘Bullet Train’. Round trip road transfers from Gifu Hashima to the Gifu Mountains. From tiny gobies to eels and large salmon-like fishes, the clear mountain streams of Gifu are full of colorful freshwater fishes. These fishes are an important part of the giant salamanders diet. During this mini-expedition, you will have the chance to explore the beautiful countryside around Gifu. In the evening we will arrive at a traditional Japanese hotel to enjoy a delicious feast that will likely seem as delightfully unusual as the animals you are here to see. Day 1 Meet and greet in Tokyo and catch the bullet train to Nagoya. Book into a hotel near the station and head out for supper (meal not included). Day 2 After a light breakfast at the hotel, you will be introduced to our guide Ito San; a local expert in giant salamanders. We will then transfer to Gifu (about 1hr), prepare equipment and immediately start looking for salamanders. After lunch you will slip back into the river for more salamander encounters. Early evening we will bring you to a traditional hotel in the hills where you will enjoy a sumptuous feast of local dishes served Japanese style. After dinner there will be time to socialize or review images before drifting into dreams filled with giant salamanders. Day 3 After breakfast at the hotel we will explore the countryside around Gifu. Then, we will return to the river to hunt for more salamanders and other river creatures. After a picnic lunch at the river you will have one more chance to snorkel with godzilla until it is time to return to Nagoya. Once back in Nagoya, we will catch the bullet train back to Tokyo, followed by final farewells.